Strobist info: I tried the Strobist method of using the ceiling as a light mod in this shot. Canon 430EX at 1/2 power bounced off of the ceiling. Fired via a Cactus V5 trigger. I’ve been doing quite a bit on diet and nutrition this summer and last Sunday I decided to take the 30 Day Primal Challenge. (Learn about the primal lifestyle at Mark’s Daily Apple.) For those of you unfamiliar with this, at the most basic level, I am not consuming any grains or refined sugar for the next thirty days. I am tracking my weight and measurements, as well as writing down everything I eat, how much I exercise, and my sleep patterns, so I will post about my experience with the challenge and the results at the end of the 30 days. While the chicken is cooking, prepare the portobello mushrooms by washing them and scooping out the gills and discarding them along with the stem. 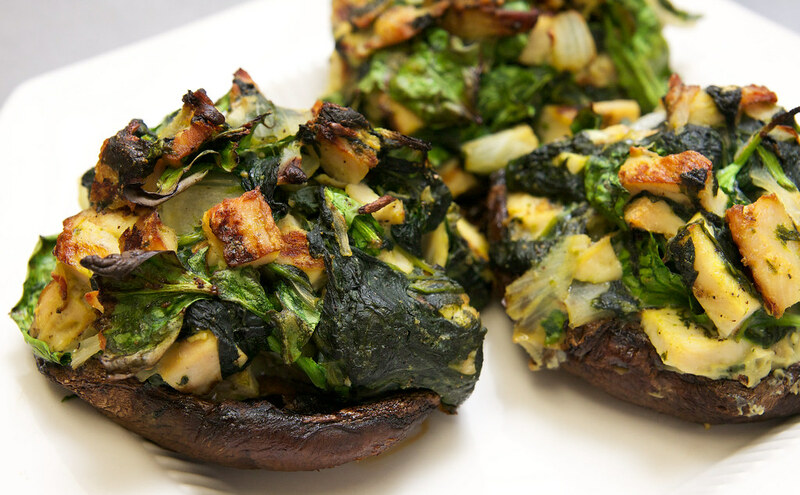 Brush the outsides of the portobellos with olive oil and put some of the chopped garlic on the inside of each one, but leave some to saute the spinach with. Then line a casserole dish with aluminum foil, put the mushrooms in it, and roast them for 10-15 minutes on each side. While the mushrooms are roasting, open the can of tomatoes and cook them in a small saucepan on high until 4/5 of the original liquid is gone. Be sure to add the parsley, oregano, basil, and a little bit of garlic to the sauce while it is cooking. I like spicy sauces, so I also added crushed red pepper. Once 4/5 of the liquid is gone, put the tomato mixture into a blender or food processor and puree it to your desired consistency. I suppose you could go out and buy your favorite marinara sauce, but what fun is that? This is a cheap, easy way to make your own. I hesitate to call this a real marinara sauce…my wonderful Italian girlfriend Amanda might object. Regardless, this was delicious, so I suggest you give it a try. Digression: Notice I have been putting ranges for the measurements and cooking times. I eyeball measurements and estimate the cooking times. Meticulously measuring and setting timers is a waste of my time. If I cut into it and it looks done, I call it done. When your chicken and spinach are done and your mushrooms have been sufficiently roasted, pull the mushrooms out of the oven. Mix the chicken with the spinach and onions, then crack the egg over top. Mix everything thoroughly. Divide the mixture into thirds, then mound it on top of the portobellos. I found my hands worked best for this (though I am a little biased because I like to do the least amount of dishes possible.) Turn on the broiler and put the stuffed mushrooms back in the oven for 5 minutes, or until evenly browned. The industrial stove I was using does not have a broiler, so I just turned the oven up as high as it would go, left the mushrooms in for 10 minutes, and called it good. 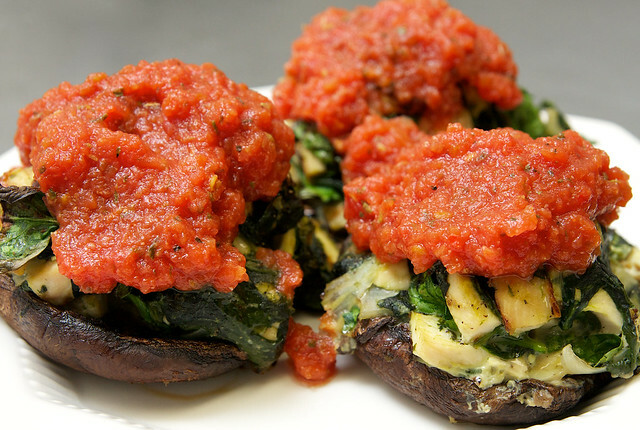 After the stuffed mushrooms are done, pull them out of the oven, plate them, and spoon some of the “marinara sauce” on top. This is where the aluminum foil will help quite a bit. You can pull the foil out of the pan with the mushrooms still on it, making them much easier to move onto a plate with a spatula. They don’t stick to aluminum foil as well as they would stick to the pan. Furthermore, it makes for easy clean up! I suggest enjoying this dish with friends and a good red wine of your choice. (It is primal!) I had a Malbec on hand, so that is what I enjoyed it with. Other suggestions: You can try this recipe with a variety of other things, depending on your preferences and dietary requirements. Other combinations I recommend trying are sausage and spinach, sausage and broccoli, chicken and cheese, steak and blue cheese or goat cheese, or chicken, red peppers, and spinach. If you try this recipe, leave a comment with your results! I am always open to recommendations. Also, if you have any questions, do not hesitate to ask. I love hearing from people!